Compare Amazon Echo, Echo Plus, Echo Spot, Echo Show and Echo Dot: What Are The Differences? Amazon's Echo familiy of devices are Alexa enabled "smart speakers", Alexa being the cloud based virtual assistant developed by Amazon that is capable of voice interaction, music playback, making to-do lists, setting alarms, playing audiobooks, providing weather, traffic, sports, and other real-time information, such as news, control smart devices, order food, making calls and more! The five main members of the Amazon Echo family come in different forms, shapes and sizes. Some are equipped with a screen and a camera, one model even has a built-in smart device hub. ​In order to allow you to select the right Echo device for your own needs, this article will compare in detail the five Echo models: Echo, Echo Plus, Echo Spot, Echo Show and Echo Dot. Echo (2nd Gen.), Echo Plus (2nd Gen.), Echo Spot, Echo Show (2nd Gen.) and Echo Dot (2nd Gen.). 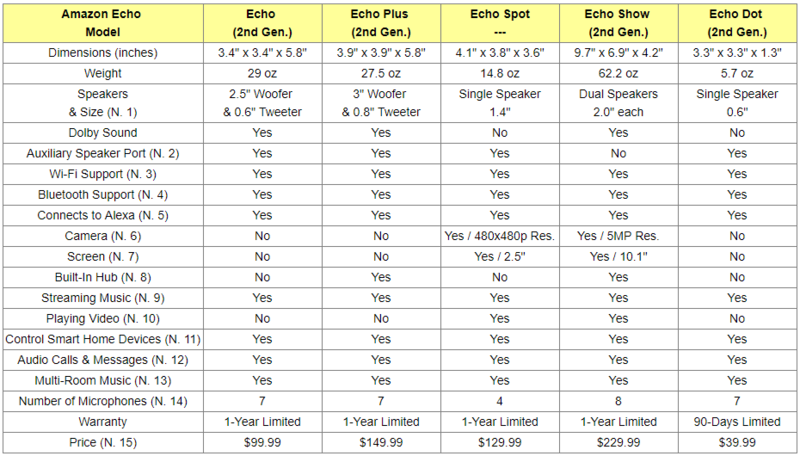 ​The following table compares the various features that come with the five Echo devices. Echo and Echo Plus are equipped with both a woofer and a tweeter powered by Dolby to deliver crisp vocals and dynamic bass throughout the room. They can fill the room with 360° omnidirectional audio. Echo Spot and Echo Dot are equipped with a single speaker, but their sound can be amplified by connecting them directly to external speakers using a 3.5 mm stereo cable or Bluetooth. Echo Show is equipped with dual powerful, room-filling speakers with Dolby processing for crisp vocals and extended bass response. Except for Echo Show, all Echo devices are equipped with an auxiliary 3.5mm port, so that if desired, they can be connected to external speakers (cables are not included). Echo, Echo Spot and Echo Dot devices feature dual-band Wi-Fi that supports 802.11 a/b/g/n (2.4 and 5 GHz) networks. Echo Plus and Echo View devices feature dual-band Wi-Fi that supports 802.11 a/b/g/n/ac (2.4 and 5 GHz) networks. 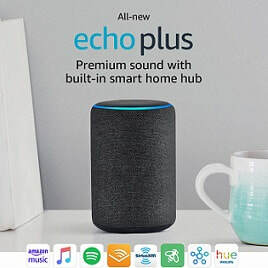 All five Echo devices are Bluetooth-enabled, so you can stream other popular music services from your mobile device to your particular Echo device or from your Echo device to your Bluetooth speaker. You can play music, set music alarms and timers, ask questions, play Audible audiobooks, radio stations, news briefs, and more. You can call or message almost anyone hands-free. You can check your calendar, weather, traffic, and sports scores. You can manage to-do lists as well as shopping lists. You can watch video flash briefings, Amazon Video content, see music lyrics and weather forecasts, display to-do and shopping lists, browse and listen to Audible audiobooks, and more. All hands-free. ​Also, you can ask Alexa to show you the front door or monitor the baby's room with compatible cameras from Amazon and others such as Nest or Arlo. The videos can be remotely accessed from your smartphone or tablet, using the Alexa app. ​Note that that the videos captured by Echo Show have much higher resolution than those captued by Echo Spot. Clearly, Echo Show has a much larger screen than Echo Spot and the images displayed have better resolution. Note that they are both touch screens. ​The built-in ZigBee smart home hub of Echo Plus and Echo View supports ZigBee light bulbs, locks, plugs, and in-wall switches. Note that not all smart devices require a hub to be operated by your particular Echo device. Smart devices that support Wi-Fi, which can attach to your home's WI-Fi signal, do not need a hub. A hub is required when smart devices use other signals besides Wi-Fi, such as ZigBee or ZWave which can't communicate directly over the internet. For example, with a Nest thermostat, which can talk to Echo devices directly over Wi-Fi, there is no need for a hub. However, if you have a smart device that uses ZigBee, ZWave or similar wireless tech, you will need a hub (either the one built into an Echo Plus or Echo View, or a separate one such as the Samsung SmartThings Hub) to bridge between the smart device and your Echo. Note that the reason other wireless protocols such as ZigBee exist is that they are usually more energy efficient than Wi-Fi and/or can act in a mesh network, so that each device passes on data to the next one, giving them longer range. Each of the five Echo device considered here allows streaming music from Spotify, Pandora, iHeartRadio, and TuneIn, giving you voice control for all of your music. In addition, with each Echo device, being Bluetooth-enabled, you can also stream other popular music services like Apple Music from your phone or tablet. 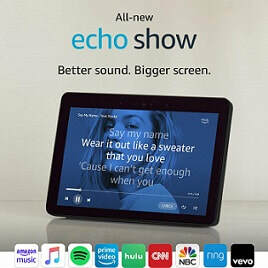 With Echo Spot and Echo Show, because they have a screen, with the streamed music, you get live show of song lyrics and album art with Amazon Music. Just ask to play a song, artist, or genre, and see lyrics with Amazon Music. ​With Echo Spot and Echo Show you can watch video flash briefings, Amazon Video content, see music lyrics and weather forecasts, display to-do and shopping lists, browse and listen to Audible audiobooks, and more. All hands-free. ​In order to control smart home devices, Alexa can interact with devices from several manufacturers including Nest, Philips Hue, Wink, ecobee, LightwaveRF, Belkin SmartThings, IFTTT and others. Developers from these manufacturers are able to create their own smart home skills using the Alexa Skills Kit. These third-party developed skills, once published, are available across Alexa-enabled devices. Users can enable these skills using the Alexa app. 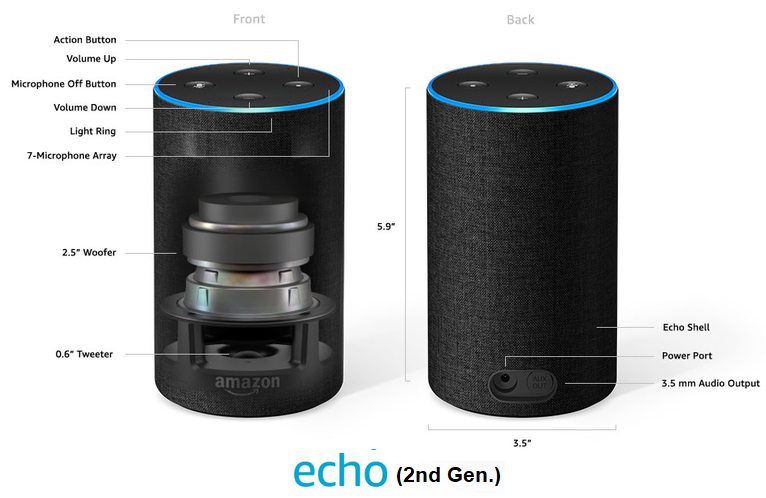 With all five Echo devices considered here, you can call or send a message to anyone who has an Echo device or the Alexa app. 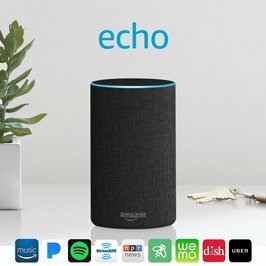 You can also connect quickly to all other Echo devices at home with simple voice control. 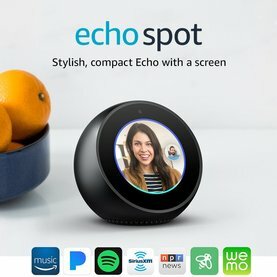 ​Note that with Echo Spot and Echo Show that are equipped with a camera and a screen, you can also make video calls. Want to play music on an Echo device that is in another room? Now, with the multi-room music feature, you can tell Alexa to play across your compatible Echo devices. For instance, you can tell Alexa to play jazz in the kitchen, pop in the family room, or play the same song throughout your whole home. The prices shown in the above table were current at the time this article was written and may have changed. For exact prices, please refer to the Amazon Products scetion below. So which Echo is best for your needs? If you are looking for a device that produces a great room-filling sound with Dolby processing with crisp vocals and extended bass response, then you should consider either Echo, Eco Plus or Echo Show. However, note that even though Echo Sport and Echo Dot have small speakers and can not produce the same kind of room-filling sound, they can be connected either with cable or via Bluetooth to your own speakers for a better and larger sound. If you are looking for not just sound, but also images and video play on your Echo, then you should consider either Echo Spot or Echo Show which are equipped with a screen and a camera. Just keep in mind that Echo Show has a much larger screen than Echo Spot. Finally, if you want to connect your Echo to your own speakers with cables, you should not be getting the Echo Show, which is the only one of the five Echo devices that does not have an auxiliary port for connecting to external speakers. But it does support Bluetooth and Wi-Fi connectivity. Please note that the Echo devices described above are designed to be used at home and need to be plugged at all time to a wall socket. Delivers crisp sound powered by Dolby, with dual stereo speakers that provide 360º omni-directional audio. Provides up to 9 hours of continuous playback (up to 8 hours when in hands-free mode). For more information on Amazon Tap and for exact price, please click the Amazon link image provided here. With Echo Dot Kids Edition, Alexa becomes a kid-friendly DJ, comedian, and storyteller. Just ask and Alexa will play music, answer questions, read stories, tell jokes, and more — all with younger ears in mind. Included is one whole year of FreeTime Unlimited that gives your kids access to hundreds of hours of fun and educational content, including ad-free radio stations and playlists, Audible books, and a growing list of premium kids skills. After one year, your subscription will automatically renew every month starting at just $2.99/month, plus applicable tax. You may cancel any time by visiting the Amazon Parent Dashboard or contacting Customer Service. Kids can control lights, plugs, switches, and more with compatible connected smart devices. Call kids to dinner or tell them it’s bedtime from compatible Echo devices anywhere in the house, without having to raise your voice. 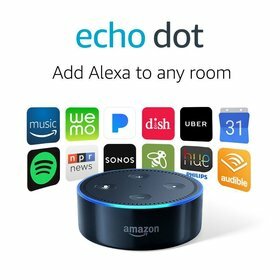 Up to $109 in savings on Echo Dot (Black), 1 year of Amazon FreeTime Unlimited, and a kid-friendly case, plus a 2-year worry-free guarantee. If they break it, return it and Amazon will replace it for free. ​For more information on Echo Dot for Kids and for exact price, please click the Amazon link image provided here.